A rocket scientist gets thrown into the world of a barista. She must learn the nuances of crema, microfoam, and latte art. Even a PhD, high-skill set rocket scientist would struggle for a time to make a proper cappuccino. The time would be short, perhaps. It's assumed the rocket scientist's learning capacity is larger than most - and she would soon master the craft, moving to sheer boredom. A barista gets thrown into the world of rocket scientist. She must come to a fast understanding of the difference between characteristic velocity and effective exhaust velocity. For a typical barista, working her way through an undergrad English program, this would be too much. It would bring on a huge level of anxiety and hopelessness. The key to flow is the alignment of growing skills and growing challenges. That's the Zone. And people work best in the Zone. But what if a barista has no desire to be a rocket scientist? Or a rocket scientist doesn't care about coffee? I believe care fits into this chart as well. With that, I say, determine a zone that you care about. Gain the skills needed to operate at an optimized level in the zone. I've had an unreasonable amount of fascination with this chart over the past couple of days. The north/south axis is challenge level, east/west is skills. Here is a more nuanced version. It was created from research done in the 90's by Mihaly Csikszentmihalyi around the idea of creativity, happiness, flow and optimal performance - and has particular application with knowledge work (although much of his research revolves around sport performance). 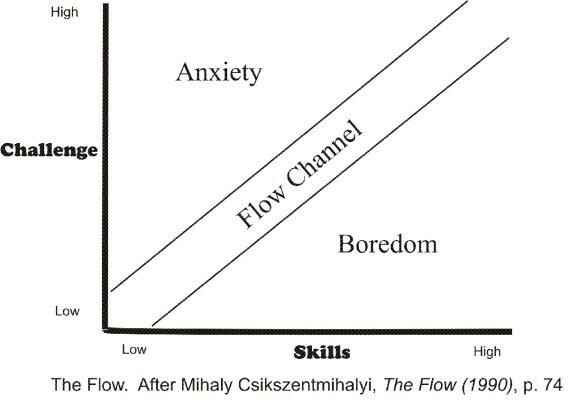 His book on flow is a classic and worth a read. His TED talk provides a good overview.